Hello, and welcome to our newly updated website! Whether you are a parent, a student, teacher, alumni, donor, prospective student, or just curious, there is much to find here. So please look around and explore. 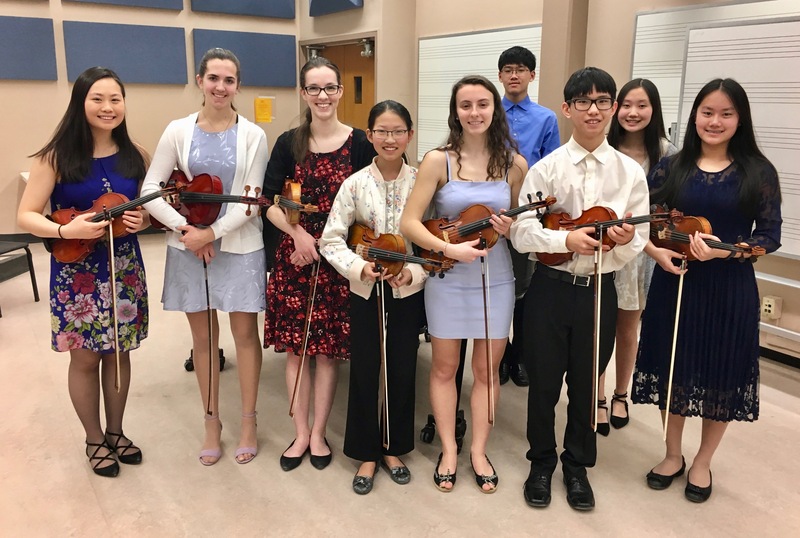 Founded in 1990, the String Academy of Wisconsin (SAW) has become one of this country’s model schools, offering students between the ages of 4 and 18 a comprehensive musical education with a focus on the violin, viola or cello. Highly qualified artist faculty provide musical instruction based on the methods and philosophies of Mimi Zweig, Shinichi Suzuki, and Paul Rolland. The special training, experience, and expertise of the SAW faculty in the musical training of young people results in students playing with technical ease and musical sensitivity. SAW’s summer teacher training workshops are attended by string players from across the United States, Canada and Europe. 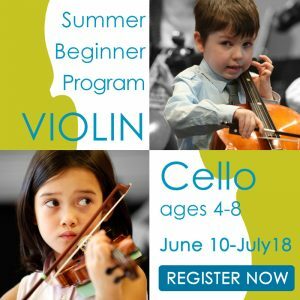 Tuesday, May 21, 2019 at 7:00 p.m.
Summer is an ideal time to get your budding violinist or cellist off to a great start with special instruction developed for children who have never played a string instrument. To get a jump-start with their new instruments, students will have one week of daily group lessons (see schedule below). For each of the other five weeks, students will receive a half-hour individual lesson and an hour group lesson. June 10 – 14: Daily group lessons will be held from 4:30-5:30 p.m.
June 17 – July 19: Half-hour individual lesson at a time to be arranged with the instructor and a group lesson once a week on Tuesdays from 4:30-5:30 p.m.
After playing your violin, take the time to clean off the rosin from the strings and the top of your instrument. A clean, cotton cloth will do the job! Also, the wood of the bow should also be wiped clean. Rosin build up can make the strings respond improperly and too much rosin on the bow will produce a “grainy” sound. Your fingers contain oils, and sweat from your hands can over time damage the varnish. When handling your violin try to avoid touching the varnished areas. The proper way is by the neck and chin rest area only. Replace your strings to make sure your violin always sounds its best! Strings gradually lose their vitality and “center pitch”. The term most often used is the string sounds “false”, you will hear several distorted pitches when plucking or bowing the open string. You also end up having to put your fingers slightly higher to play the note in tune, which is developing a habit that you should avoid. When changing the strings, remember to replace them one at a time. Begin by placing the violin on your lap, loosen and remove the string from the peg, remove the peg from the pegbox, wipe the peg clean with a soft cloth, apply sparingly a commercial “peg dope” to help the peg turn smoothly, place the peg in the hole of the pegbox, turn a few times, now you are ready to place the end of the string which has a “loop” or metal “ball” into the tailpiece slot, then place the other end of the string into the small hole of the peg, overlap the string once before you continue to wrap it around the peg. Make sure to wind the string close to the wall of the pegbox. This will help the pegs from slipping. It is now time to check your bridge. Your bridge position should be flush with the top of the instrument and form a right angle. The bridge holds the strings at the correct height and distance from each other and sends the sound from the strings to the hallow wooden body of the instrument. The “barbs” on each hair of the bow eventually wear out and then the string does not vibrate to its full potential, which lessens the sound. The bow hair may feel slick and become more difficult to produce a clear articulation, more rosin won’t help. Bows need rehairing with good quality, unbleached horse hair. A bow maker uses between 150 and 200 hairs from the tail of a horse for a violin bow. Make sure the new bow hair is not too long, when this happens, one cannot tighten the bow properly and there will be too much space between the frog and thumb wrap. The end of your thumb wants to touch the edge of the frog, the wood and the leather wrap. Touching the leather wrap prevents slipping and squeezing with your thumb! Please remember to loosen your bow hair before returning it to your case. This will help maintain its “camber” or bend. Try not to touch the horsehair with your fingers. Wood changes seasonally, in dry weather it shrinks and in humid warm weather it swells. When a seam is open, you may hear a buzz sound when playing. Tapping gently on the back or top of the violin with your finger knuckle will give you a different sound than a closed seam. Sometimes you can even see the open seam. A luthier will use a melted hide glue to close the open seam, clamp it overnight and it will be as good as new! Hide glue is a strong, water soluble matter that also allows the luthier to take apart and put back together an instrument when necessary. Having open seams glued on your violin is a standard part of violin maintenance. Your fingerboard will eventually develop “grooves” or “ripples” from the thousands of times your fingers made the string rub against the fingerboard. A “dressing” or planing of the fingerboard is needed, making the surface of the fingerboard smooth again. A luthier is needed for this. Use a small zip-lock bag. Cut a sponge into a 1 inch by 2 inch piece. Wet it, then squeeze out any excess moisture. Put the moistened sponge in the zip-lock bag and seal almost shut (leave an inch open). Place in your violin case and it will help against the dry heated air. Take your violin to a luthier at least once a year. It’s probably time for that 15,000 note checkup! The luthier will carefully examine and recommend what needs to be done to keep your violin in excellent condition. Proper daily and yearly maintenance of your violin will give you many years of pleasure and ensure the life of your violin for hundreds of years to come! Congratulations to all contestants on their performance! Thank you to former MSO violinist Les Kalkhof for judging the competition. Also, thank you to pianist Steve Ayers for accompanying all eleven contestants. One of the most rewarding gifts teachers receive are heartfelt messages and success stories from former students. Music transforms lives in a multitude of ways. Scientists have found that music lessons profoundly transform a child’s cognitive abilities resulting in increased learning capacity, focus, empathy, and the ability to interact with others. Sadly, today fewer schools, especially in low-income areas, can offer this opportunity to students. 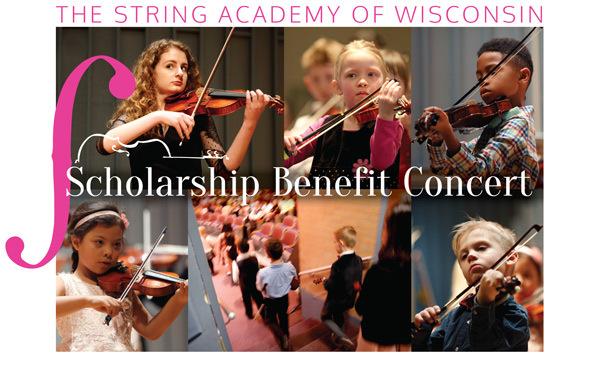 This year (our 29th), approximately 90 children ages 4-18, from all cultural and socioeconomic backgrounds, study violin and viola at the String Academy of Wisconsin. SAW’s professional faculty carefully guide students in a challenging course of study that includes weekly private and group instruction, classes in music theory/ear training, and numerous solo and group performances. Our comprehensive curriculum encourages and develops teamwork, problem solving, and self-confidence that benefits students in their music studies and beyond. By educating the WHOLE child, SAW offers preparation for success in school and life! The Academy strives to make an excellent music education possible for low-income families through our acclaimed Urban Students in Arts Outreach program which includes two primary strategies for providing high quality music education and instruments to USAO students. Scholarships and instruments to 25 students annually whose families could not otherwise afford music lessons. Partnerships with Milwaukee Public Schools where a majority of students are from low-income homes. Our faculty is providing instruction to students with demonstrated potential and a strong desire to learn at Escuela Vieau, an MPS K-8 school. These students (along with other USAO recipients) also come to the Academy for weekly group instruction and performances. We were able to enroll more Vieau students this year, but children still remain on the waiting list of this popular program. Providing instruction, instruments, music is costly — a minimum of $2,500 per student. These programs can only continue with contributions from foundations and generous individuals like you, who understand the profound importance of the arts in a child’s development. Thank you! and develop through music education – no matter their financial circumstances? Your gift of any amount matters and is greatly appreciated. It is instrumental to our success in educating the whole child. Sheet music for your studies can be acquired in different ways, ordering from the many online music outlets, purchasing from your local music store and downloading from the internet. A public domain internet library can give a student free immediate access to music, but let’s remember YOU GET WHAT YOU PAY FOR. Too many times the downloaded parts have a lack of valuable information (articulations, bowings, fingerings) and wrong notes. Also one’s downloading, for quick access, many times turns into never purchasing the published music. After several weeks, you have a crinkled, torn copy of music that is difficult to keep on the music stand and information written by your teacher is becoming less clear. Another and better option is getting a photocopy from your teacher’s library, which has their fingerings and bowings, with the clear understanding that it is temporary. Before you order or visit the local music store, ask your teacher which edition (ex. Bärenreiter, Boosey & Hawkes, Breitkopf & Hartel, Carl Fischer, G. Henle, International, C.F. Peters, G. Schirmer, Schott etc..) you should purchase. Published violin music is edited by violinists/teachers, for example Johann Sebastian Bach’s Six Sonatas & Partitas for Unaccompanied Violin has been edited by some of the greatest violinists and teachers, Nathan Milstein, Leopold Auer, Henryk Szeryng and Ivan Galamian. Each edition offers different ideas, is a wealth of information and an investment in your continuing music education. Another important aspect of published sheet music, the piano accompaniment is included! A few examples, Mollenhauer’s Infant Paganini, Introduction and Polonaise by Bohm, Dancla’s Six Airs Variés, Polish Dance by Severn, Ten Have’s Allegro Brillante, Czardas by Monti, Haydn’s Concerto in G major, Concerto in A minor by Accolay, Viotti’s Concerto No. 23 in G major, Concerto in A minor by Bach, Wieniawski’s Obertass etc…, with the piano part you now have a better understanding of how the violin and piano work together, helping your learning process towards a more successful performance! The next time you attend a solo recital or an orchestra concert that is featuring an international soloist, often there is a “Meet The Artist” after the performance. What a fun and inspiring opportunity to ask the soloist if he or she would autograph your published music. You might even be studying the same piece that was performed! This will be something that you will treasure for the rest of your life. 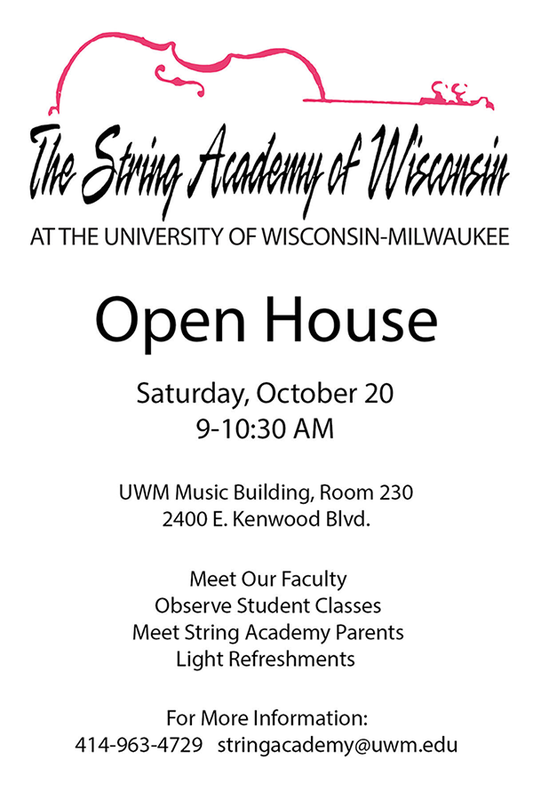 Come and see the String Academy in action! 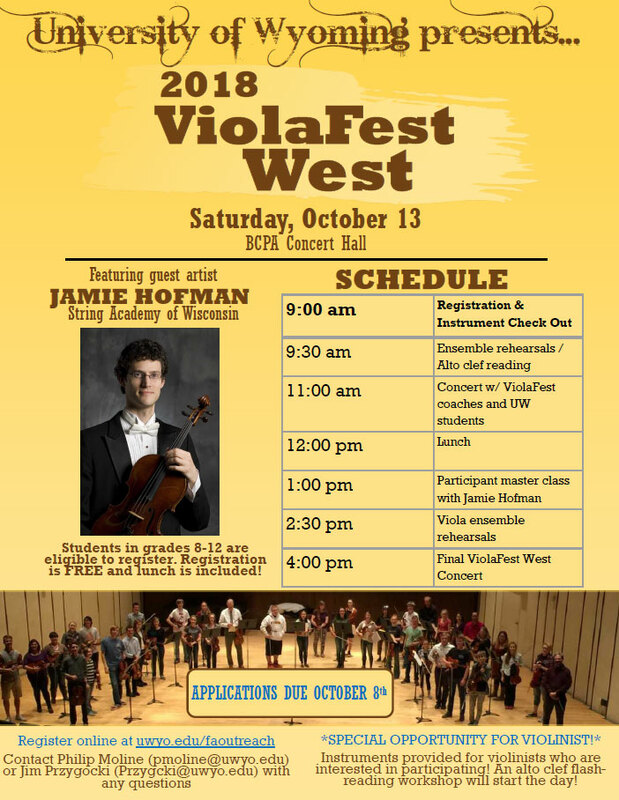 Violafest West, featuring SAW’s own Jamie Hofman! We wish Jamie Hofman well in his adventures to the University of Wyoming, Laramie! Let the love of literature, painting, sculpture, architecture, and above all, music enter into your lives.